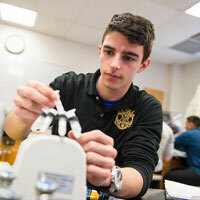 Webster University faculty members and students are invited to attend Biology senior thesis presentations, May 10 from 9 a.m.-3:30 p.m. in the EAB, room 253/262 and on May 11 from 9:30 a.m.-3 p.m., EAB, room 253/262. Webster University faculty members and students are invited to attend eleven senior Biology senior thesis presentations on Thursday, Dec. 15, from 9 a.m.-3 p.m. in the East Academic Building, room 102. 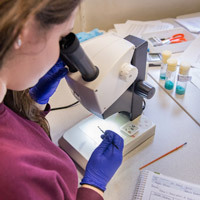 Faculty members and students are invited to attend eleven senior Biology senior thesis presentations tomorrow, April 29, from 9 a.m.-3 p.m. in the East Academic Building Room 263. 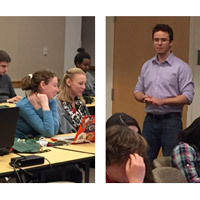 Alumnus Jeffrey Berry ('12), who holds Webster undergraduate degrees in Biological Sciences and in Mathematics, returned to campus to lead 20 undergraduate students, alumni, and faculty in the Biological Sciences in a workshop to use RStudio for data analysis and presentation. Berry, who now works at the Danforth Plant Sciences Center, was brought in as guest of the Students for Biological Sciences club.